Few industries have made as impressive a comeback from the recession as manufacturing. Millions of jobs were created within the sector in 2018 alone, a number of them returning to the United States after being sent overseas. Despite the strides made, it appears as though manufacturers are well short of the talent they need to fill open positions, according to the results of a recent joint study. Assuming the current skills gap continues, the number of jobs that require filling is slated to jump from 488,000 at the present time to potentially as many as 2.4 million in 2028, based on newly revealed estimates from Deloitte and The Manufacturing Institute. Should this come to pass, approximately $454 billion in manufacturing gross domestic product could be adversely affected. Manufacturing is one of the prime contributors to U.S. GDP, accounting for at least 12.5 percent, according to the Economic Policy Institute. Paul Wellener, vice chairman of industrial products at Deloitte LLP, indicated that the extent to which the industry has developed - and continues to expand - is substantially faster than many anticipated. "Manufacturers in the United States are experiencing some of the highest levels of growth we've seen in decades, yet the industry seems unable to keep up with the resulting rebound in job growth," Wellener explained. "With nearly 2 million vacant new jobs expected by 2028, compounded by 2.69 million vacancies from retiring workers, the number of open positions could be greater than ever." Wellener further stated that this is a key challenge manufacturers must address, and the sooner the better so the U.S. economy can continue to thrive. A potential answer to the skills gap conundrum is artificial intelligence, which would essentially fill roles formerly employed by actual workers or outfit those newly created. Industry veterans have some trepidation about the advancement of AI, fearing that it will continue to escalate and put millions of the sector's employees out of work. However, based on a study from McKinsey & Company as well as several other projections, AI's implementation will likely lead to an uptick in new roles, thereby offsetting positions lost to robotics, The Wall Street Journal reported. "89% feel positive about where their business is headed." Regardless of what role AI will play within the industry in the coming years, the vast majority of manufacturers are confident that the best is yet to come for their companies. 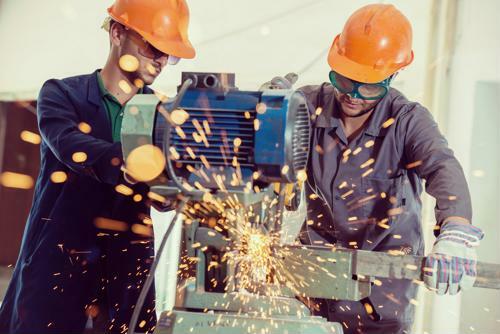 Nearly 89 percent of respondents in the National Association of Manufacturers' fourth quarter survey said they were positive about where their business is headed, down slightly from the 2018 annual average of 92.4 percent, which was an all-time high. Carolyn Lee, executive director at The Manufacturing Institute, said concerns about the skills gap may be to blame for the modest slide in sentiment. But rest assured, industry leaders are putting their heads together to come up with a solution. "We're driving a range of initiatives, designed to engage and inspire more young people, more women, more veterans and more Americans of all backgrounds to build great careers in the industry that built our country," Lee said. Chad Murray, NAM chief economist and director at the Center for Manufacturing Research, noted that some of these hiring strategies include appealing to candidates' desire for flexibility, offering jobs that can be worked at all hours or from multiple locations. Training is another option that manufacturers are offering so candidates don't necessarily need years of experience prior to applying. Nearly two-thirds of businesses say they're willing to provide on-the-job training, according to the The Manufacturing Institute and Deloitte study.